POSTED: Peter Gorski on Oct 1st, 2012 · No Comments on $20.7B spent mobile shopping. Doubled. Although the mobile commerce market has been reality for some time now, mobile retail sales figures were disappointing. At least until now. According to Econsultancy the number of people shopping on their mobile devices has doubled in the past year reaching a very respectable $20.7B USD. 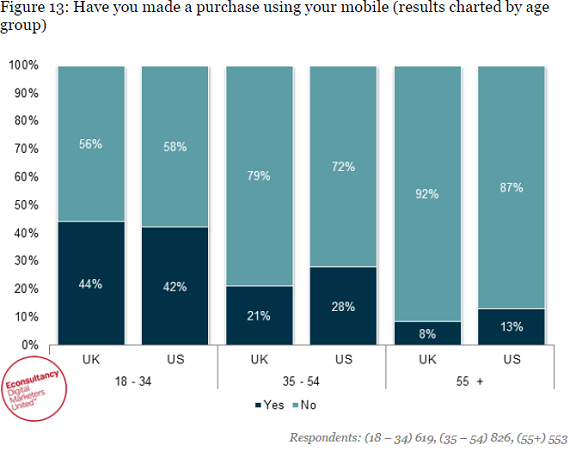 A hard-core skeptic will be quick to point out that the number of mobile shoppers is still only 28% in the U.S. and 25% in the UK, and many didn’t actually complete a purchase via a mobile device (i.e. click on ‘Submit Order’ button). But it is the entrepreneurs, not the skeptics, who will appreciate the fact that this number has doubled in the past year from 12% and 13%, respectively. And if we consider age, interesting new facts come to light. Nearly half of those in the 18-34 age group had made purchases on a mobile device, with 42% in the U.S. and 43% in the UK. That number does not reach 30% for 35-54 year olds, and online shopping barely even seems to occur at all with those 55 and older, with only 8% in the UK and 13% in the U.S. taking part in the practice. 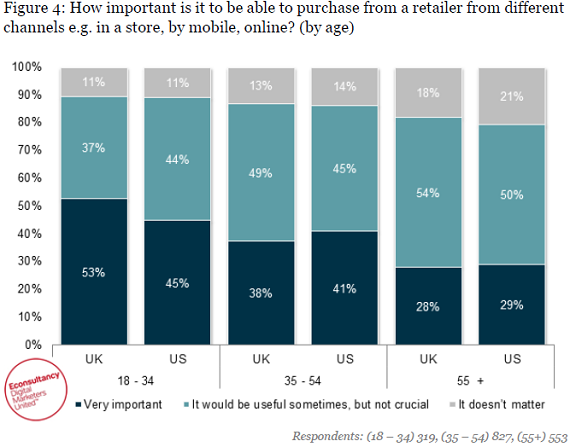 Furthermore, nearly 4 out of 10 surveyed in both countries felt it was important to have the ability to purchase products from a retailer using different channels such as online, mobile or in-store. Now to the best part, the strategy for entrepreneurs. Nearly all consumers said that they do research online before making a purchase (94% in the U.S. and 92% in the UK). This statistic suggests that while 35-54 year olds may not feel comfortable buying things using the mobile or online channel, they value it as an important source of information. Given these findings, numerous multi-channel retailers in UK started to monetize on this behavioral characteristic by allowing consumers to reserve products online and pick them up in person at a later date. 60% of those surveyed said that they have used the in-store pick-up service, compared to only 38% in the U.S. in the past year.